JJ Loughran engineers recently completed a 2 – day course aimed at ensuring their engineers are expertly trained and equipped to carry out work safety inside wind turbines. The training covered everything from health and safety regulations to the rescue of co-workers in distress. JJ Loughran recognises the growing importance of the wind turbine sector in the local economy and we wanted to ensure that our engineers have the best and most up to date training available. At present, our own engineers when working in conjunction with wind turbine installers and owners, can carry out a number of checks inside a turbine including electric system checks, testing and inspection of generators, electric drive motors and gearboxes. If we find faults on site we can either review the feasibility of carrying out the repairs locally or removing equipment to be fully overhauled at our engineering workshop. See recent overhaul of Vestas wind turbine. ABB Generator Division is a major supplier to wind turbine sector. As JJ Loughran is an approved ABB Authorised Value provider we can not only overhaul and repair these machines, but also quote for new ABB generators and smaller ABB electric motors used in hydraulic, cooling and drive systems. The aforementioned wind turbine training was carried out by ‘ARCH Training’ at their state of the art facility in Lisnaskea, Enniskillen. 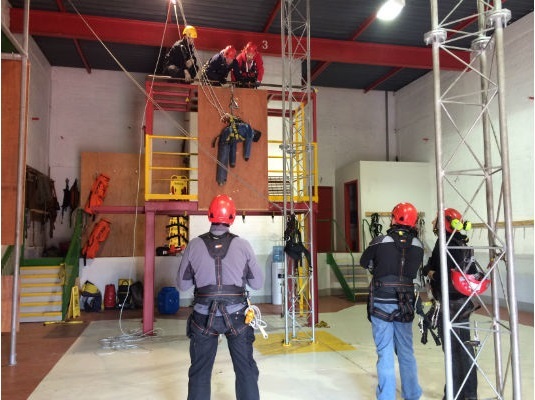 The training has been assessed and certified as meeting the requirement of RUK AND GWO criteria for training providers for both RENableUK Working at height & Rescue – Wind Turbine Standard and GWO BST Working at Height Standard. © Copyright JJ Loughran Ltd. All Rights Reserved.